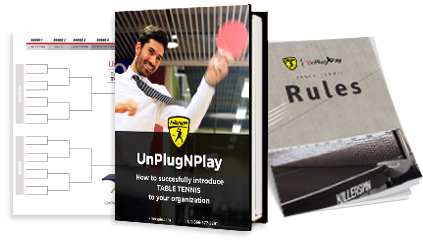 Build a better culture by putting a paddle in every hand and experience the benefits of UnPlugNPlay. Wow your employees with the Gold package. Each Gold package comes with two high-end Revolution tables, plus 100 customized paddles. Table tennis helps people build authentic relationships and creates positive energy by rewarding hard work with short breaks from electronic devices. Free tables, free shipping, free White Glove Delivery, and Concierge Service at your fingertips.